Picture a cozy summer morning. You're still lounging around the house in your pajamas with a freshly brewed cup of coffee and the smell of warm cinnamon and lemon zest wafting through the house. 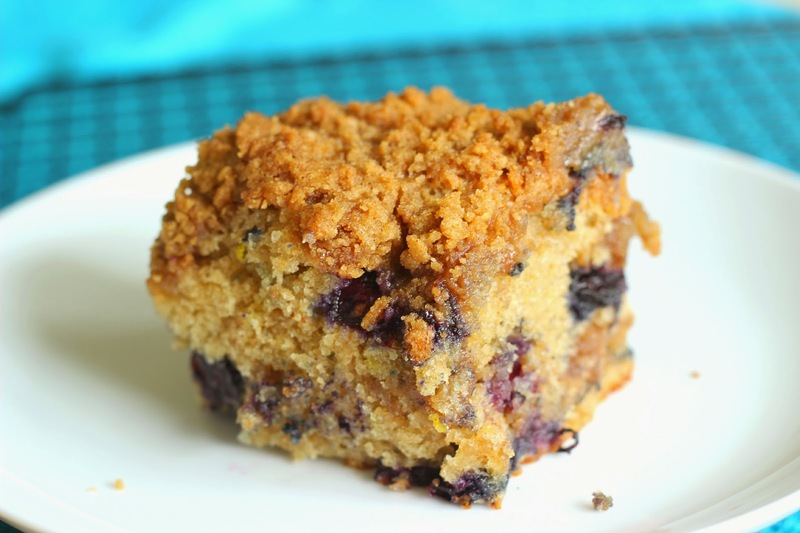 In just a few short minutes, the oven timer is going to go off and you'll be ready to indulge in a freshly baked cinnamon streusel topped coffee cake that is filled with juicy fresh blueberries. If you like the sound of that, you're definitely going to need to try this classic recipe. 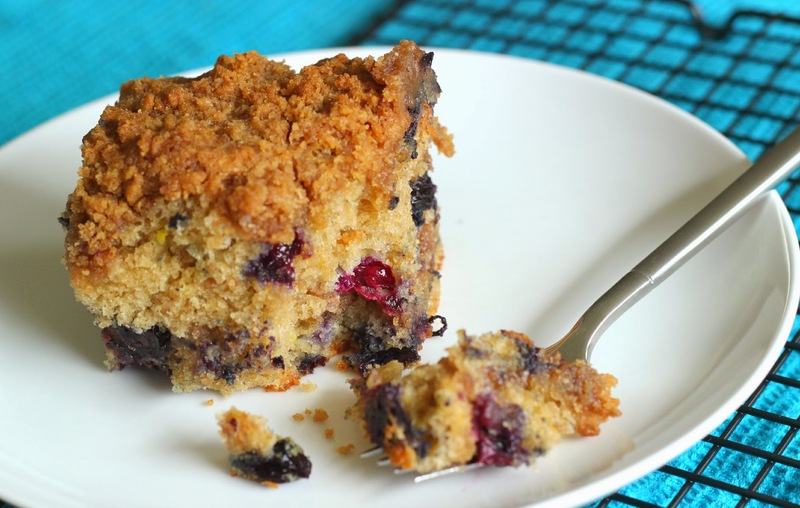 This coffee cake has been jazzed up with a tiny hint of citrus and high protein greek yogurt to keep it moist and fluffy. I hope you are prepared for friends, neighbors, and family to beg you for the recipe, because this one is a crowd-pleaser! 1) Preheat over to 350 degrees. Use cooking spray to grease an 8-inch square pan. 2) Combine the first 5 dry ingredients in a bowl and whisk together. 3) In a separate bowl, mix lemon zest and sugar until combined. Next, add butter to the sugar mixer and cream on medium for 3 minutes until the mixture is fluffy and smooth. 4) Add the eggs to the butter mixture one at a time and beat until well combined. Mix the greek yogurt and vanilla into the batter. 5) Now add the dry ingredients slowly until just combined (don't over mix). Carefully fold in fresh blueberries. 6) In order to make the cinnamon streusel filling and crumb topping, put sugar, flour, cinnamon, and salt into a bowl and lightly whisk until ingredients are well distributed. On a cutting board, slice stick of butter into small pea-sized chunks. Add butter to flour mixture and work it using your fingers until it reaches a crumb like consistency. 7) Pour half of the batter into the square pan and spread to all edges. Sprinkle half of the cinnamon streusel over the batter making sure it is covered evenly. Next, in small dollops add the remaining portion of batter on top of the crumb filling and lightly spread. Sprinkle remaining cinnamon streusel on top. 8) Place coffee cake on the middle rack and bake until golden. To ensure the middle is baked thoroughly, insert a toothpick into the center portion to see if it comes out clean - approximately 50 minutes. Allow coffee cake to cool down for 10 minutes, cut, and serve. Now grab a delicious cup of joe, kick up your fuzzy bunny slippers, and enjoy. I am so excited for this!!! It will be one of the first things I make after my very loooong Paleo month is over!!! Yummmmmm... I need this in my life, NOW!